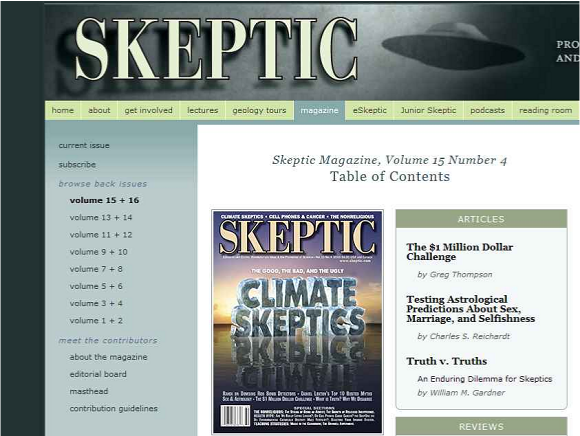 This series of guest articles has been provided to us courtesy of the author, Bernard Leikind, as well as the original publisher Skeptic Magazine. We think these articles are of interest because they address the scientific understanding of the actual physical effects of cell phone radiation on biological systems. The physics of the interaction is far below the threshold at which any biological damage can occur. This makes it extremely unlikely that any harmful effects from cell phones or other form of non-ionizing EMF will ever be found. However, research is continuing in the area of EMF and health since science can never absolutely prove a negative and because of ongoing public concerns. Over half the world's population now uses a cell phone on a daily basis. That's a lot of radiation, and the public has wondered if we should be concerned. In her new book, Devra Davis cites recent research linking cell phones to brain tumors and other health problems. The five-year Interphone Study, funded by the European Union and health agencies in 13 countries, recently published its findings, which many scientists find inconclusive. The wireless industry and government agencies from the FDA to the CDC to the WHO tell us there isn't enough evidence that cell phones are harmful. But many cancers take years to develop - have researchers had enough time to know for sure? And, if you've heard the warnings, have you dialed back on your minutes? Bernard Leikind, PhD., independent physicist and author of the article Do Cell Phones Cause Cancer? The International Agency for Research on Cancer, an agency of the World Health Organization, produced scary headlines yesterday by warning that cell phone radiation might cause brain cancer. Tentative as it is, that suggestion contradicts the IARC's own $24 million study of a year ago, as well as the FDA and scientists who claim it's physically impossible. Everybody agrees more research is needed, but five billion people have taken to cell phones in less time than it takes many cancers to develop and grow. Will the WHO issue new guidelines? Should users take precautions on their own? We hear some conflicting opinions. Abstract: Dr. William Bruno asserts the well-known fact that cell phones radiate microwaves in the classical regime. This, he says, means that the photon energy is not relevant to assessing safety. Citing optical tweezers as an example of biologically relevant non-thermal effects of electromagnetic radiation, Bruno concludes that all other reports of non-thermal effects from microwaves are likely valid. He seeks safety thresholds based upon requiring that cell phone energy density be less than kBT. This proposal and related ideas produce thresholds many orders of magnitude below present values. While Dr. Bruno is correct that cell phone microwave radiation is generally in the classical regime, he uses peculiar estimates (number of photons per cubic wavelength) that overstate the circumstance by more than 20 factors of ten. He misunderstands the operation of optical tweezers and ignores their significant thermal effects. He credulously accepts poorly supported claims of non-thermal effects. He mistakenly believes that kBT is the average thermal energy (per cubic wavelength or per cell) in materials. It is not. It is twice the average energy per molecule per degree of freedom in the material. The thermal energy density is (1/2)kBT X (average number of degrees of freedom of the molecules) X (Avogadro's number). (Avogadro's number is 6 X 1026 molecules/mole.) Thus, Bruno's proposed safety thresholds are more than 1025 too low. Using the correct value for the average thermal energy would place the thresholds close to today's standards. Throughout his analysis he neglects the index of refraction of living tissue, n ≈ 9, or the absorption length, α ≈ 1 cm -1, in the microwave region. Do Cell Phones Cause Cancer? 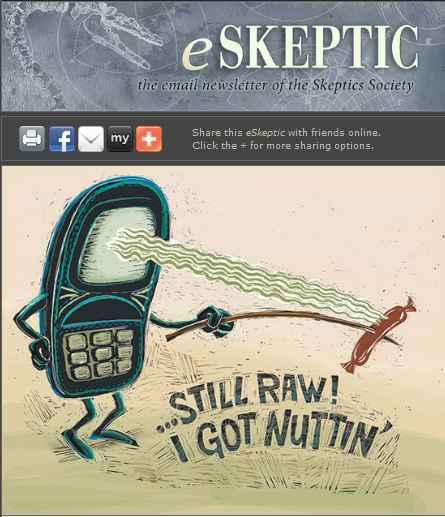 The original article was published in the Vol 15 No 4 2010 issue of Skeptic Magazine. The article generated a considerable volume of response. We recommend that you check this out by following this link. Do Cell Phones Cause Cancer (2)? The second article was published in the online eSkeptic magazine in response to the large amount of interest. You can check out the comments on this article by following this link. About the author: Bernard Leikind is a plasma physicist who has researched and taught at the University of Maryland, UCLA, at General Atomics, and the Livermore National Laboratory. He is known among skeptics for his investigation, explanation, and demonstrations of firewalking, and for his articles about science and its social significance. He lives in Encinitas, California, near San Diego. He pays a cell phone company for his phone service and does not and has not received any funding from any phone company. EMF & Health is interested in contributions from other guest authors. Please contact webmaster@emfandhealth.com.